Heat stress is the principal factor limiting production of animal protein and negatively affecting the health and welfare of cattle in subtropical and tropical regions. Detrimental effects on livestock productivity associated with heat stress are expected to intensify and expand into currently temperate zones upon the realisation of predicted climate change (Figure 1). The Intergovernmental Panel on Climate Change (IPCC), which includes more than 1,300 scientists from the United States and other countries, forecasts a temperature rise of 2.5 to 10 degrees Fahrenheit over the next century. 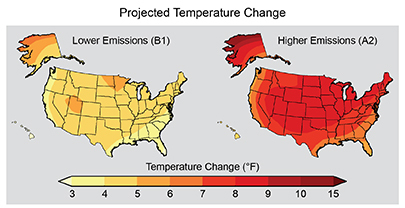 Most animal-producing areas in the US are predicted to experience extreme summer conditions and by 2100, average temperatures in the US are projected to increase 2° to 6°C, depending on the emissions scenario and climate model applied. The number of days with maximum temperatures above 32°C (90°F) is expected to increase. The SE and SW areas of the US currently average 60 such days per year but is projected to experience at least 150 such days a year by the end of the century. Development of effective strategies to improve the ability to cope with heat stress is imperative to enhance the productivity of the US livestock industry and secure global food supplies. Although swine, poultry and dairy cattle are more severely affected by heat stress than beef cattle, their confinement and intensive production systems make climate control via housing design and management interventions feasible. Beef cattle, particularly those in the cow-calf segment, are typically reared in extensive systems with limited opportunities for controlling environmental stress (Figure 2). Genetic improvement is one of few feasible strategies for ensuring adequate and sustainable production of beef protein in an increasingly hot world. Substantial differences in thermal tolerance exist among breeds and among animals within breeds indicative of opportunities for selective improvement. For example, Bos indicus cattle exhibit increased resistance to many environmental stressors relative to Bos taurus, but tend to have slower growth, lower fertility and meat quality as they have not been as intensively selected for these traits as specialised Bos taurus breeds. Use of genomic tools to produce an animal with superior ability for both thermal adaptation and food production represents an energy-efficient sustainable approach to meet the challenge of global climate change. Thermoregulation is a process in which environmental information provokes an appropriate response (e.g., vasoconstriction, panting), to maintain body temperature within the narrow range necessary for optimal cellular and molecular function. This is accomplished by jointly regulating heat production and heat loss. Beef cattle regulate internal heat production (by modulating basal metabolic rate through thyroid hormone actions and changing feed intake, growth, lactation, and physical activity) and heat exchange with the environment (by increasing blood flow to the skin, and increasing evaporative heat loss through sweating, panting and behavioural wetting of the skin). Hyperthermia results when these adjustments are not able to mitigate the environmental heat stress and body temperature increases. Improvements in production, such as increased growth rate, lead to increased metabolic heat production and exacerbate the problem of thermoregulation. Thus, for example, there is a negative genetic correlation between milk yield and ability to regulate body temperature during heat stress in dairy cattle. Unless accompanied by changes that increase heat loss capacity, improvements in production make animals more susceptible to hyperthermia during heat stress. Figure 1. Projected Temperature Change. Warming is ultimately projected for all parts of the nation during this century. In the next few decades, this warming will be roughly 2°F to 4°F in most areas. By the end of the century, U.S. warming is projected to correspond closely to the level of global emissions: roughly 3°F to 5°F under lower emissions scenarios (B1) involving substantial reductions in emissions, and 5°F to 10°F for higher emissions scenarios (A2) that assume continued increases in emissions. (Figure source: NOAA NCDC / CICS-NC). The strategy we are undertaking is to reveal the genetic architecture of traits defining thermal tolerance using Bos indicus influenced cattle, in particular, Brangus (Brahman x Angus). In comparison to straight Bos taurus populations, we expect that the major genetic variants controlling thermal tolerance will be segregating in these indicine-influenced populations due to the length of time since divergence of the two subspecies, natural adaptation to different environments, and exposure to an artificial selection of different intensities and with different objectives. Our goal is to discover genetic variants responsible for thermal tolerance and use this knowledge to develop genomic tools to improve thermal tolerance in cattle populations at risk of exposure to heat stress. Our research will use a system biology approach by integrating genomics and phenomics with additional -omics data to understand the genetic architecture of thermal tolerance. Frequent body temperature measurements, skin temperature, and perspiration rate in free ranging cattle will be recorded during heat stress on 2,000 Brangus heifers genotyped with the 250K functional SNP chip. Phenomics for thermal tolerance and genomic data will be integrated to identify chromosomal regions associated with regulation of body temperature. We will use this information to develop tools to be used in selection and management programs designed to mitigate the effect of heat stress in indicine-influenced beef cattle populations that predominate in hot and humid regions of the US and globally. In depth knowledge of the genomic variants with major effect on thermal regulation and the maturation of technologies for gene, editing means that thermotolerance genes can be rapidly introduced into thermally-sensitive breeds such as Angus, Simmental, and Holstein to allow producers to exploit genetic lines of cattle selected for high productivity with minimal disruption by heat stress. Development of ‘the cow of the future’ with high productivity and resistant to heat stress will be realised through the use of genomic selection within indicine-influenced breeds and through the application of gene editing technologies that allow genetic variants conferring thermal tolerance to be rapidly incorporated into non-adapted breeds.